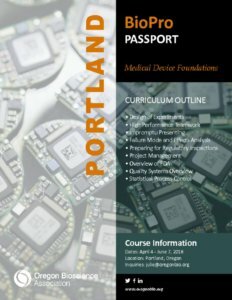 The BioPro Medical Device Foundations Passport is a comprehensive 10-day training series. With a formal steering committee of human resources representatives and industry experts, Oregon Bio selects courses and instructors that will have the most value to industry and their workforce development needs. From business topics including project management and impromptu presenting to technical topics including quality, design and control, this series is built to train current and future medical device professionals. Registration in the Certificate automatically enrolls you in the classes below and provides a significant savings versus purchasing each class individually. High Performance Teamwork, April 26, 8:30 a.m. – 5 p.m.
Project Management, May 9 – 10, 8:30 a.m. – 5 p.m.
Failure Modes and Effects Analysis, May 20, 8:30 a.m. – 5 p.m.
Statistical Process Control, June 6 – 7, 8:30 a.m. – 5 p.m. Impromptu Presenting, June 27, 8 a.m. – 12 p.m.
Design of Experiments, October 7-8, 8:30 a.m. – 5 p.m.
20 available	 Med Device Certificate (Member) $2,995.00 Employees of Oregon Bioscience Association member companies receive discounts on BioPro classes. Visit the Membership Directory for a list of current member companies.